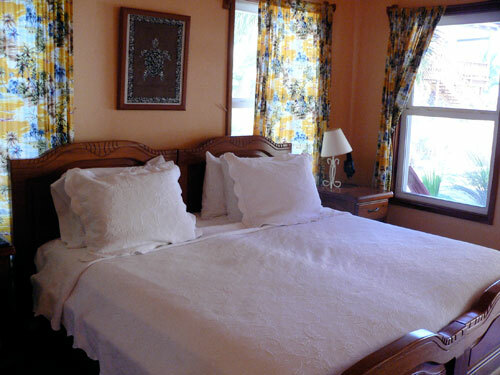 The El Pescador Family invites you and your family to join them for a relaxing stay at their seaside resort. 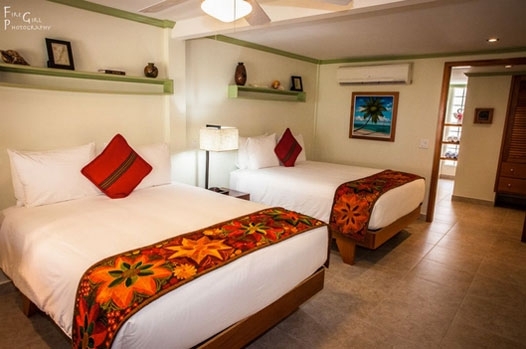 The colonial style lodge, situated on a private coconut studded beach, is slightly isolated and away from the hustle and bustle of crowds yet close enough to San Pedro to enjoy a day shopping or an evening in town. 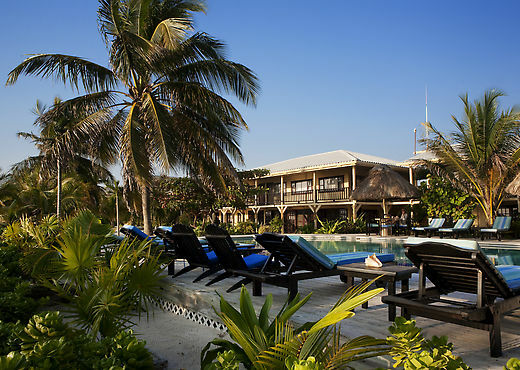 El Pescador is nestled on the Bahia del Punta Arena with an immaculate beach of graceful palms and flowering tropical plants. 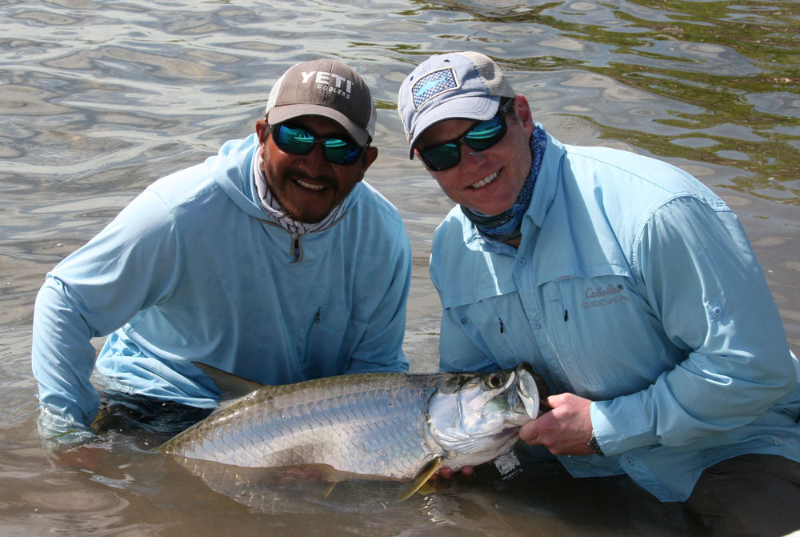 El Pescador is the perfect vacation destination for fly fishing fanatics and their non fishing friends and relatives! 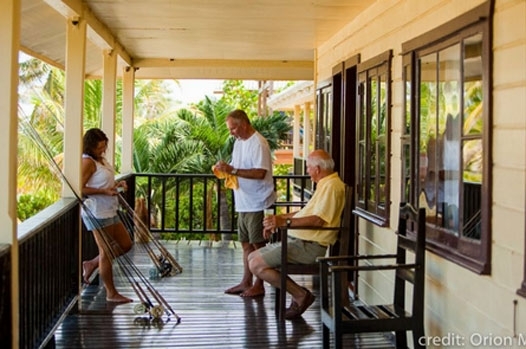 Few Caribbean destinations can match the world class fishing with the world class diving, activities, accommodations and service that El Pescador offers.The owners of the resort manage and live on the premises to ensure warm, personal service around the clock. 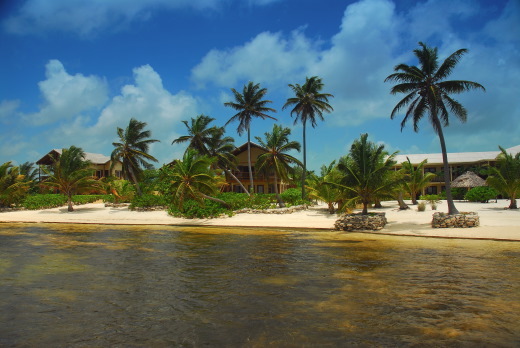 Your trip begins with your arrival into Belize City. You will need to board a small plane for the final flight to the island. 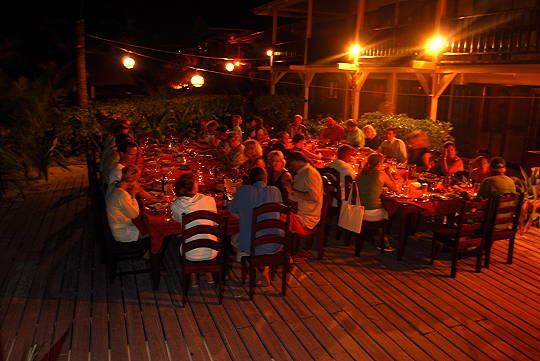 A representative from El Pescador will meet you at t airstrip for the short boat ride out to the lodge. 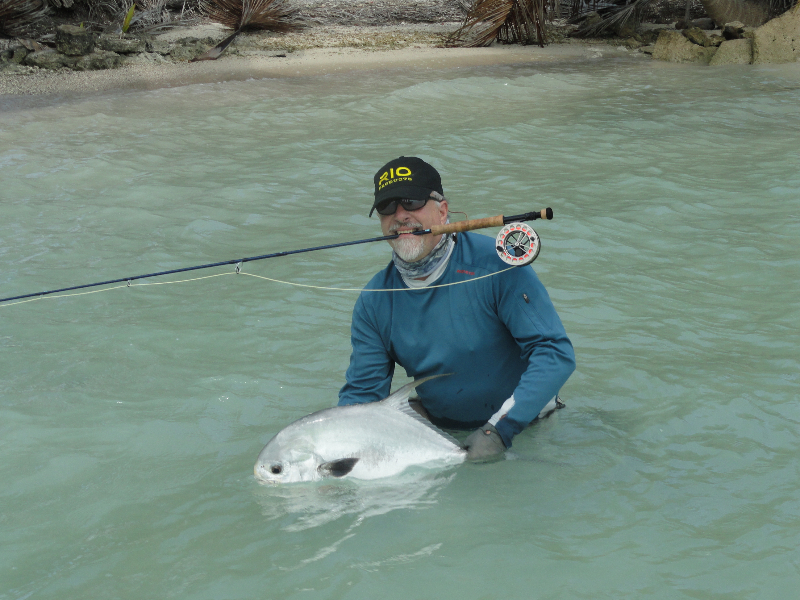 El Pescador has been recognized by top anglers for over 25 years. 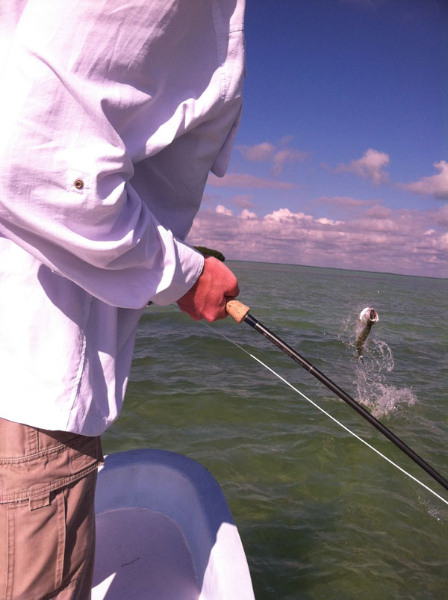 Catering to all types of fishermen, the lodge specializes in light tackle, salt water, fly fishing for Tarpon, Bonefish, Permit and Jack Crevalle. 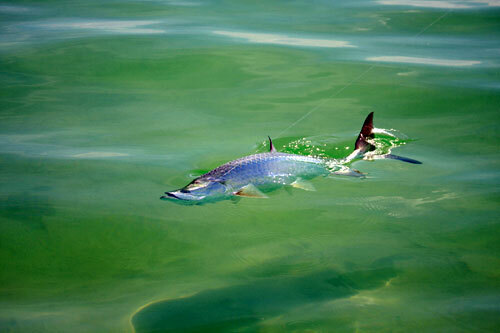 Our shallow water contains the only classic tarpon flats outside of south Florida. 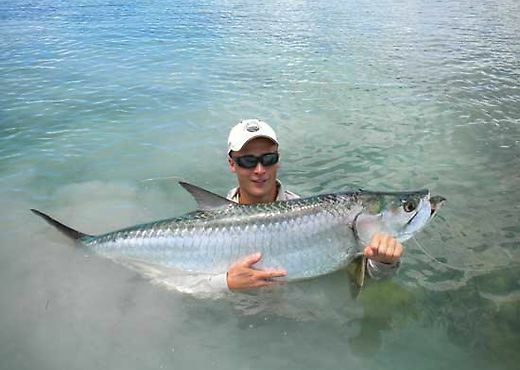 Our Flats are also world renowned for the opportunity to site cast to tarpon 12 months per year. 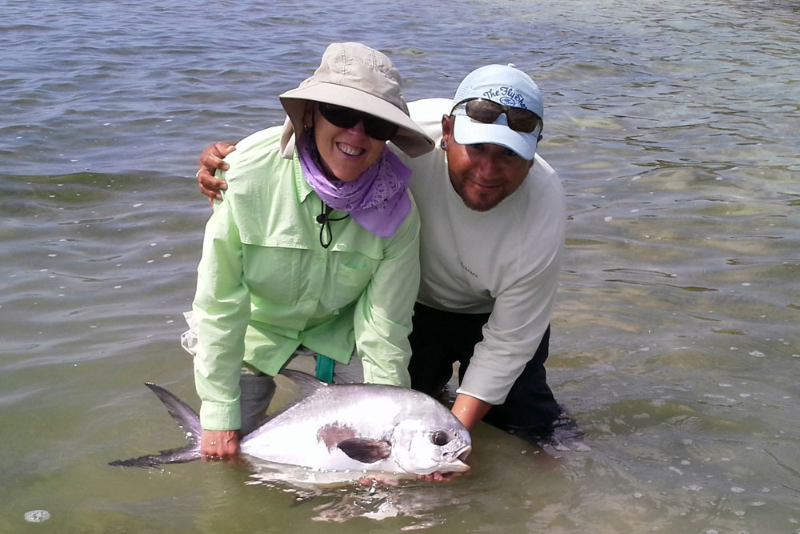 Come to El Pescador and achieve an angler’s ultimate dream- a Grand Slam! 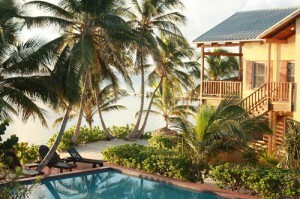 El Pescador lodge features a long verandah overlooking the beach and the pool and the barrier reef. 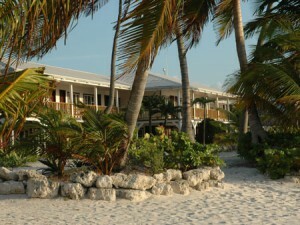 The immaculate beach reflects the well maintained mahogany building. 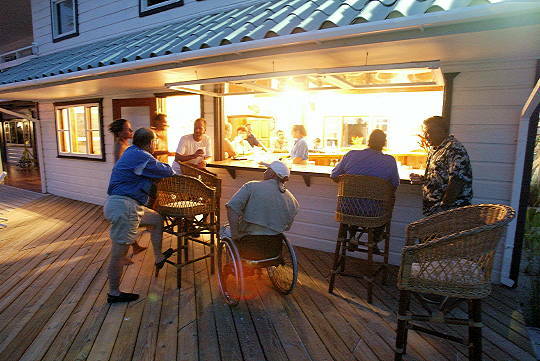 We have accommodations for 28 people but restrict the number of fishing guests so we insure productive fishing. 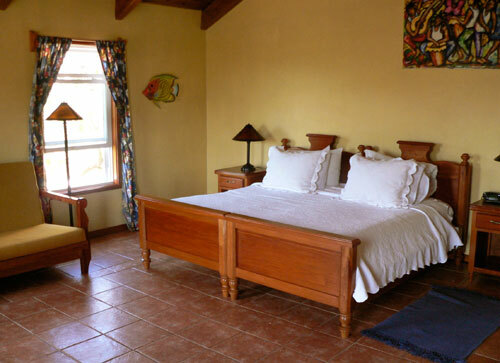 The rooms are clean and quite comfortable with private baths, overhead fans and air-conditioning. The intimate, well stocked bar features an exquisite fresh fruit rum punch and is the perfect place to swap stories after a day’s activities. Hors d’oeuvres are served in the evening. 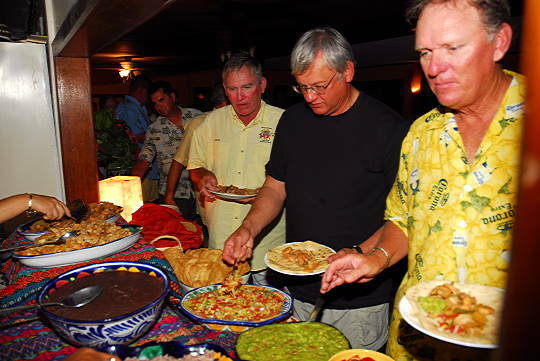 Buffet style meals are a delightful blend of both local and American dishes consisting of fresh seafood, a meat selection, potatoes, rice or pasta, fruit, vegetables, a garden salad and home baked bread. Dessert is complemented by coffee and tea. 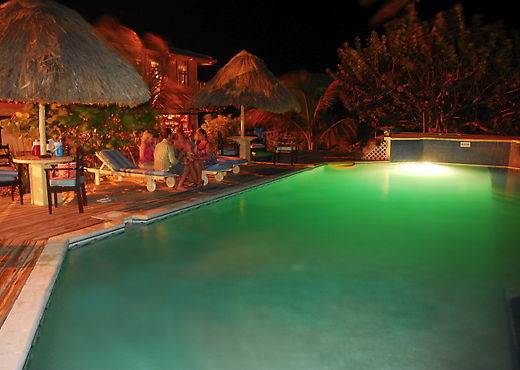 After dinner enjoy a relaxing dip in our swimming pool or a walk back into San Pedro for a little night life. Or you could just go back to the room and re rig that leader that was demolished by that tarpon that go the better of you. 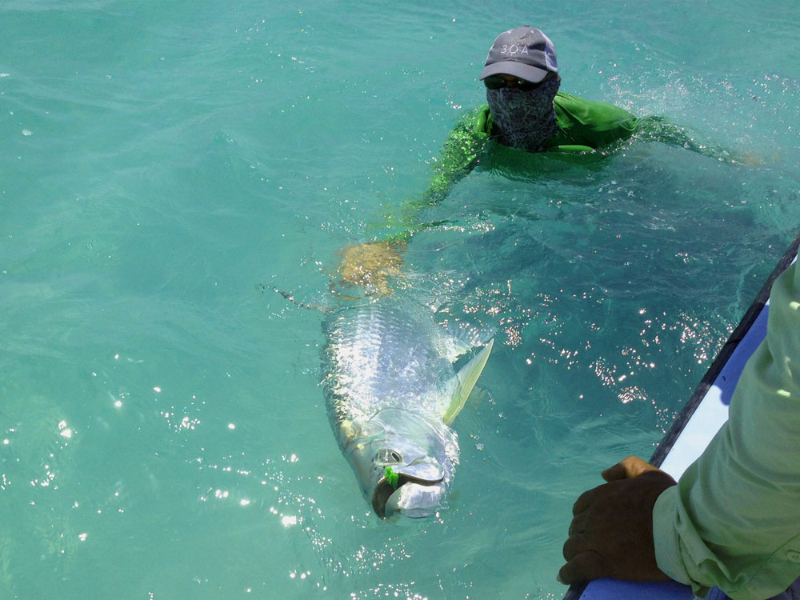 After an exhilarating day fishing, enjoy the numerous other wonders Belize has to offer. 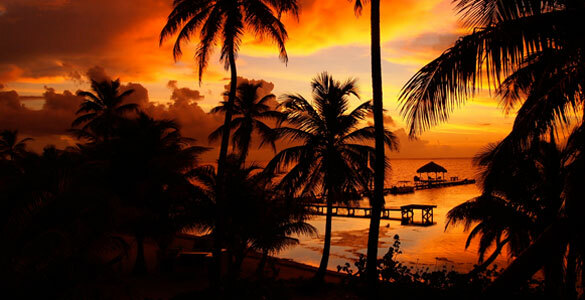 The Caribbean Country is host to diverse activities and abundant natural beauty. Under the pristine azure sea lies the world’s largest living coral reef, acclaimed to be one of the world’s best destinations for Scuba Diving. 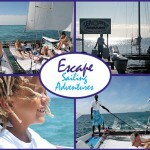 Speckled with 200 cayes our barrier reef is home to the Hol Chan Marine Reserve and Shark and Sting Ray Alley. 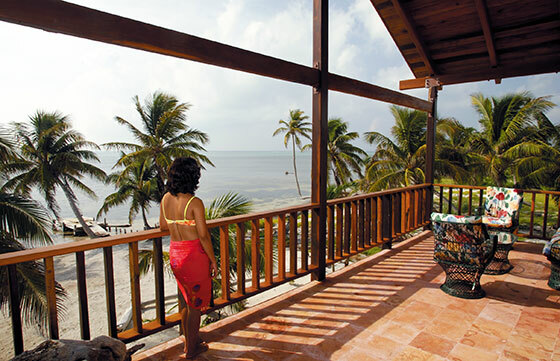 On the mainland, a short flight away, the magic of Belize stretches back for centuries. Explore mighty Mayan ruins, the lush rainforest, exotic wildlife and beautiful orchids. Guided trips to these exceptional destinations are available on a daily basis through the lodge. 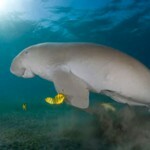 Scuba Dive the countless finger canyons and caves that create part of the longest living barrier reef in the world. 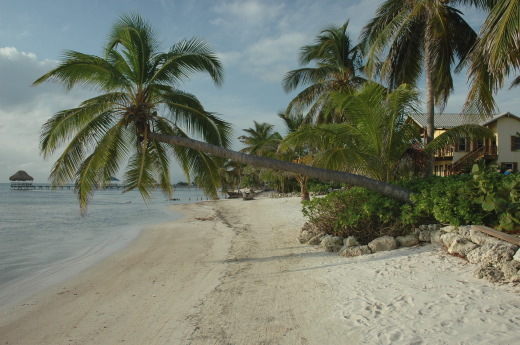 Snorkel the Hol Chan Marine Reserve and Mexico Rocks, enjoy the ancient Mayan ruins, the lush rainforest and exotic wildlife. 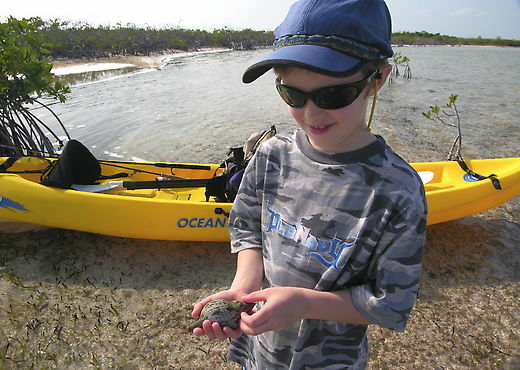 Watch and visit with friendly manatees, or swim with tame sting rays and nurse sharks. 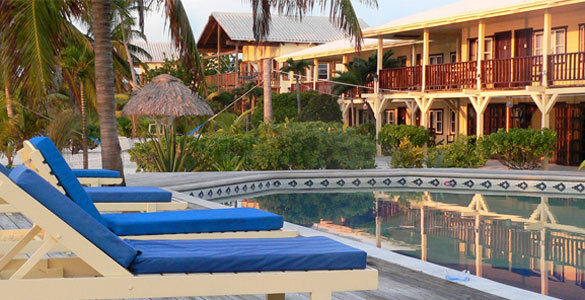 El Pescador is a family-run resort on Ambergris Caye of the northern coast of Belize. Although the lodge started as a fishing lodge in the middle of nowhere it has blossomed into a resort suitable for the entire family. There are only a handful of destinations in the world that will please the most avid of flats fishermen, divers, beachcombers. There are no compromises for anyone. 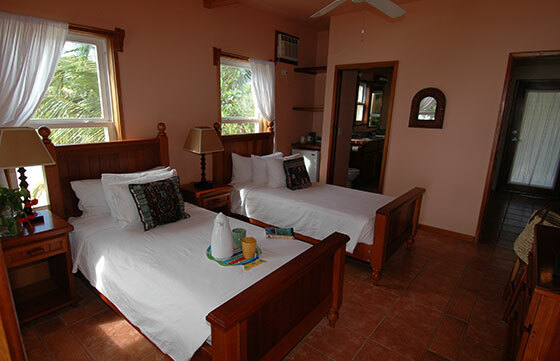 At El Pescador you may choose from a standard room in our main lodge or a private villa 1, 2, or 3 bedroom villa accommodations. Our main lodge is an intimate, 14-room hotel set in a colonial style mahogany building with a long verandah overlooking the beach and barrier reef. El Pescador Villas are a collection of 8 buildings with beautiful one, two and three-bedroom villas, set in 2 individual groupings, each surrounding a private pool. 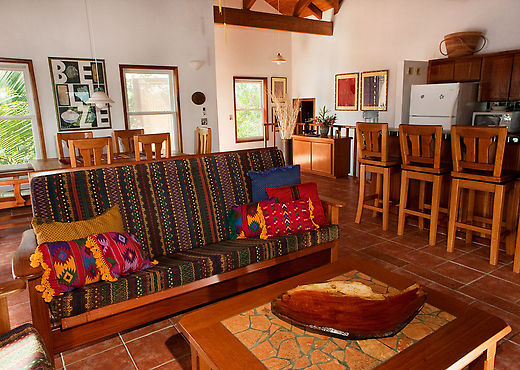 El Pescador Villas are available for those who want a bit more luxury and space and are best suited for 4-6 people. 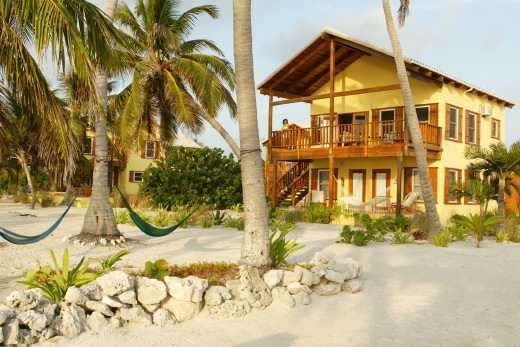 The villas are a collection of four, luxury two-story, three bedroom Villas, set in tropical gardens, surrounding a private pool, adjacent to the fabled El Pescador Lodge on the shores of Ambergris Caye. 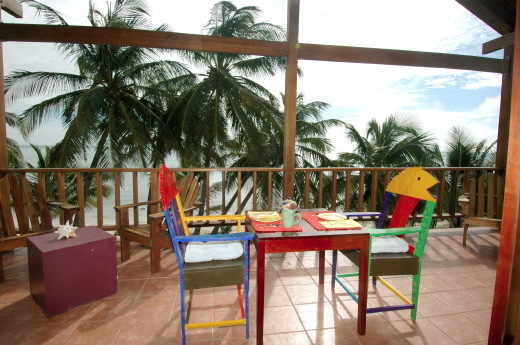 Close enough to San Pedro to enjoy its charm, but far enough away to afford privacy, peace and exclusivity. 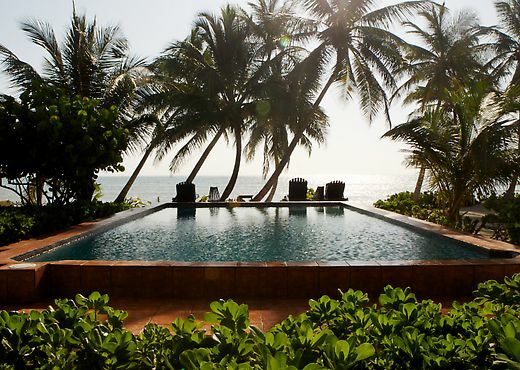 Close enough to the lodge to enjoy its every service yet removed enough that the sunrises are yours alone and the whispers of the sea seem to speak only to you. 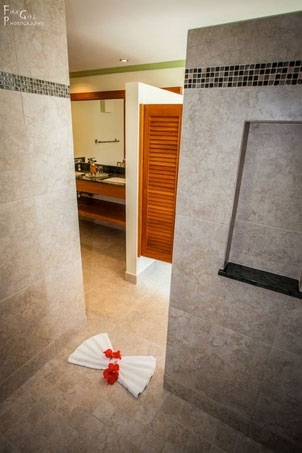 Upon entering one of our spacious Villas via a dramatic plank staircase to the upper level, Guests will walk through a mahogany door into a magical Great-Room with polished Belizean hardwoods gracing soaring cathedral ceilings. 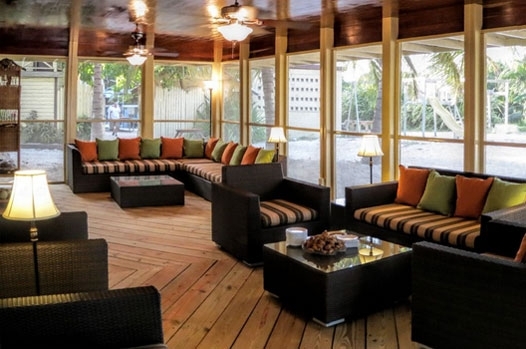 From every vantage point in this large open room you have stunning views of the beach and the Belize Barrier Reef across an open expanse of turquoise Caribbean Sea. 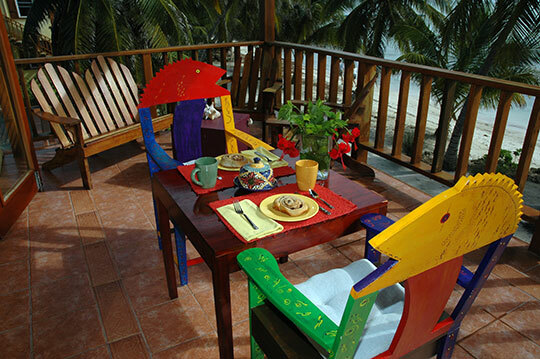 Each home is uniquely furnished; all feature lovingly handcrafted furniture made from exotic hardwoods, tropical bamboo, or traditional wicker. Walls are graced with local paintings, crafts and tapestries. An exotic array of tropical flowers and greenery are tucked here and there as a special “Welcome to Paradise”. 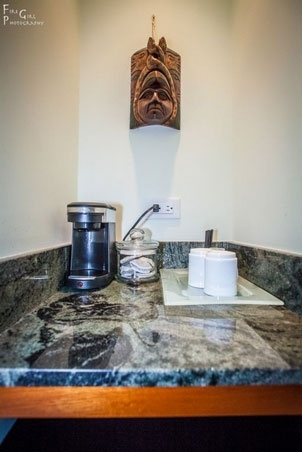 In the Great Room you will find a fully equipped gourmet kitchen (no gadget or appliance has been overlooked) with mahogany cabinets, a breakfast bar, handmade/hand painted ceramic tile counters and all the amenities you wish for a perfect stay. A breezy dining area comfortably seats six for dinner. The large, open living area is perfect for romantic snuggles or lavish entertaining. For convenience there is a full bath just off the Great Room. 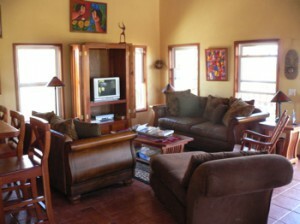 Also found on this upper level is a lovely private bedroom, tucked conveniently off the entry foyer. French doors open to the best seat in the house – the upper level covered veranda that encompasses 250 square feet of unfettered space, views and fresh Caribbean breeze. 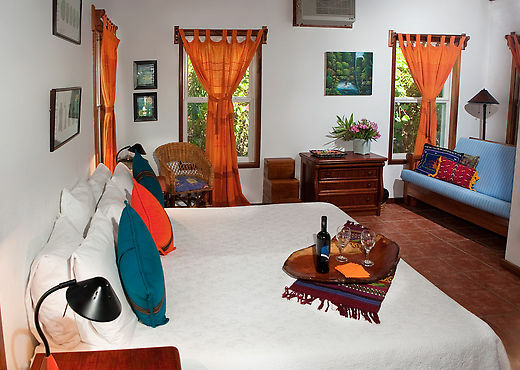 Furnished with cushy sofas or whimsical hammocks, this may become your favorite room in the Villa. 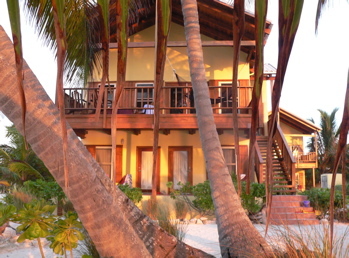 An interior stairway leads down to the beach level where two master bedroom suites are located. You will have a sea view right from your bed! 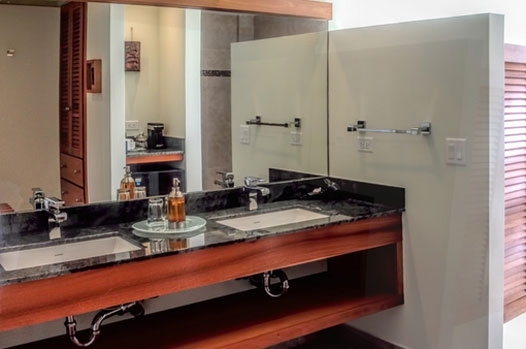 Each of these master suites is fully self-contained with luxurious bathrooms featuring his and hers hand-made ceramic sinks and matching tiles, amazing showers, spacious closets and fluffy towels awaiting your visit. For your convenience, there is a mini-frig in each of these self-contained suites. 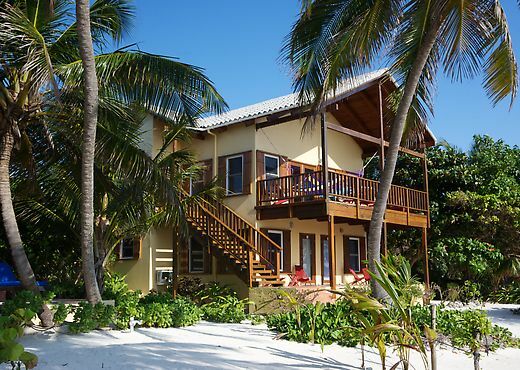 Each bedroom has a private entry opening directly to a large beachside veranda. 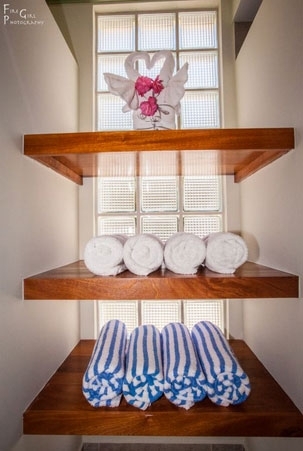 You may enjoy the entire Villa as a home-away-from-home, or request only the portions that you wish since each Suite locks-off into a private unit. Whether you need one master suite, or you want to reserve one master suite and the Great Room we can do that too; just tell us what configuration works best for you! 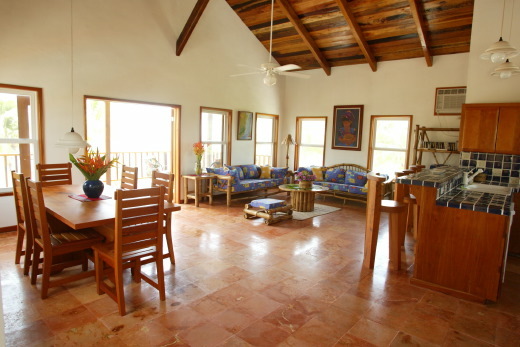 Great Room with dramatic cathedral ceilings of fine Belizean hardwoods. Large open gourmet kitchen with hand made ceramic tile counters, mahogany cabinetry, top of the line appliances including dishwasher, trash compactor, convection oven and coffee machine. Floors of coral stone with agate and crystal inclusions. 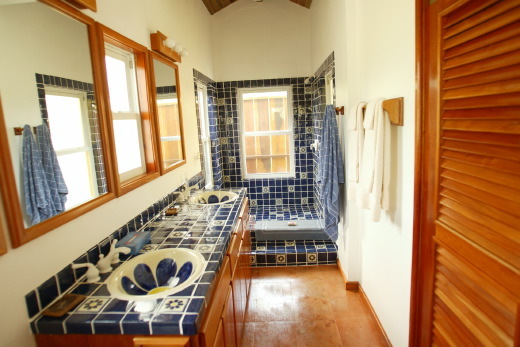 Full Bath with exquisite ceramic tile and sink. Mahogany French doors open to wide covered veranda. 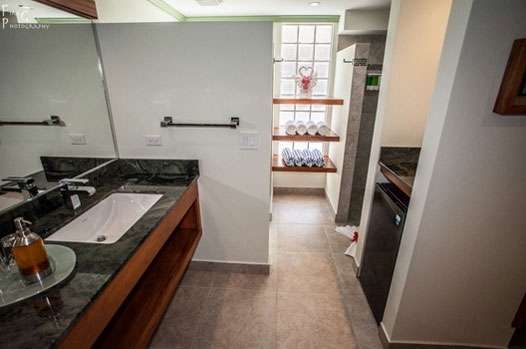 Two full bedroom-bathroom suites. 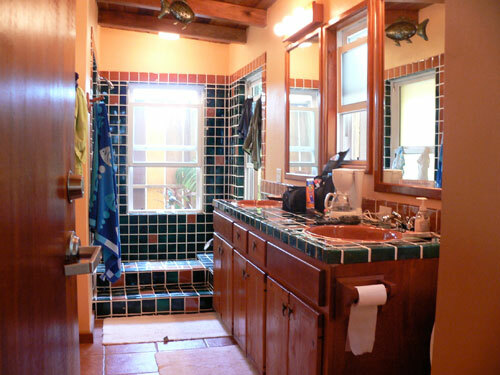 Each bathroom features hand-made ceramic tiles and sinks. 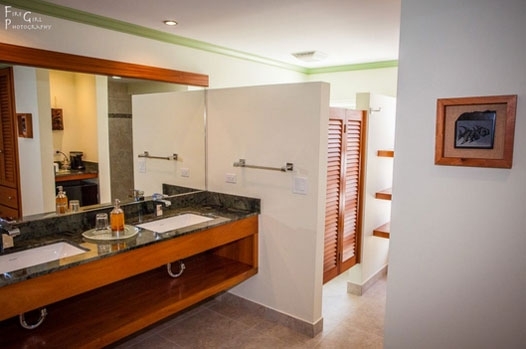 One bathroom features a lavish “jungle shower”…. 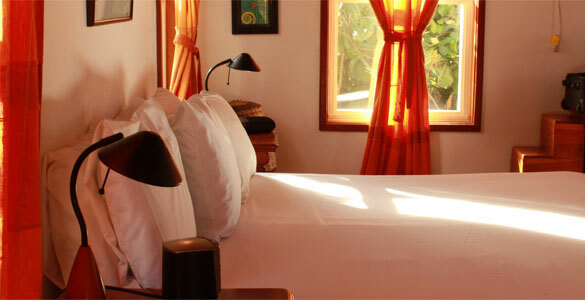 Each bedroom has private entrance from the beach, and opens to a covered stone patio facing the sea. 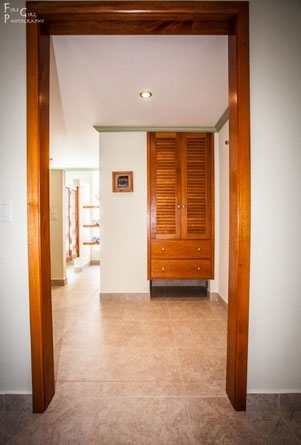 Additionally …… large storage/laundry room. 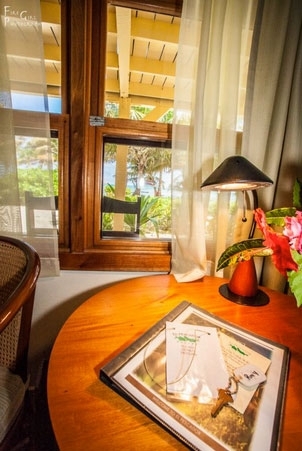 Our gracious, mahogany colonial lodge is right on the beach, facing the sea, surrounded by the fragrance of tropical flowering plants and the whisper of shady palms. 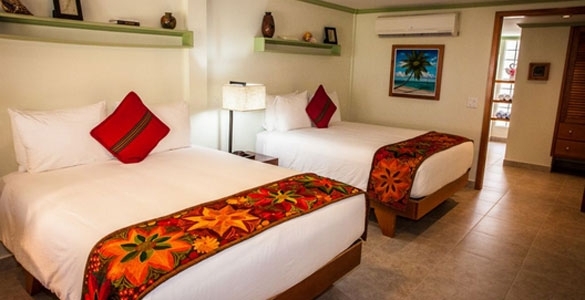 Not only will you find the serenity and relaxation you are looking for, you’ll have the convenience of being within walking distance of San Pedro Town and its gift shops, restaurants, bars and night spots. 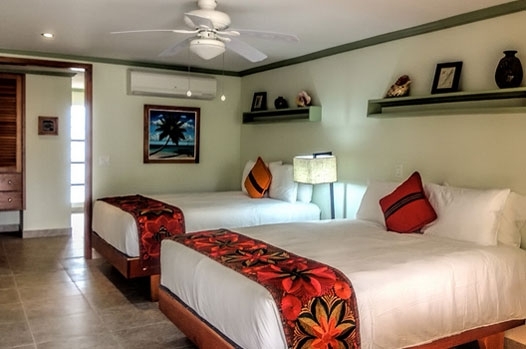 All our lodge guest rooms have private baths, overhead fans and air-conditioning and are just steps away from our swimming pool adjacent the beach. All rooms face the sea. 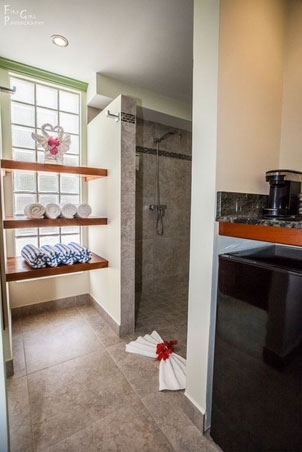 These rooms are large and all feature a private bath. 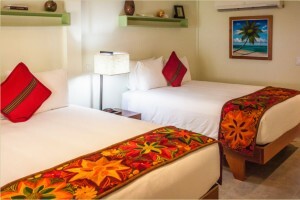 The rooms have been remodeled and can be set up as a king bed or as 2 queen beds. 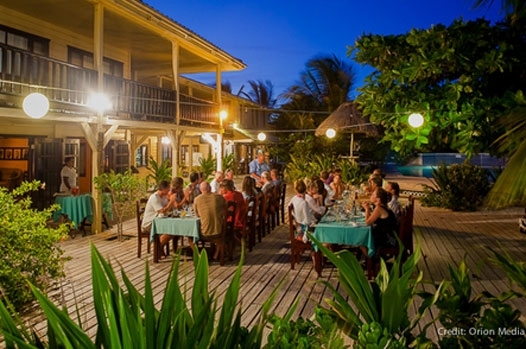 El Pescador started as a fishing lodge and conitnues to build on this heritage. 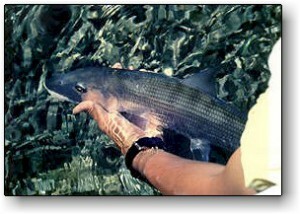 Although the atmosphere is that of a resort there is no mistaking it is a fly fishing destination. 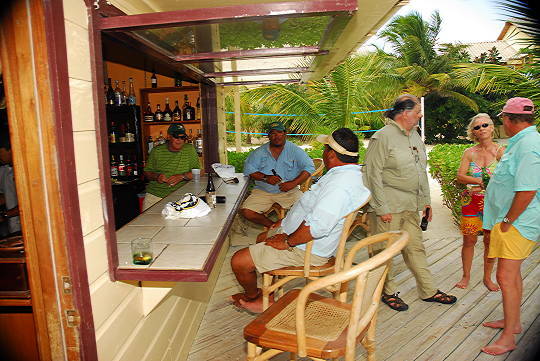 It is the only lodge in northern Belize that has staff guides, a full time fishing director and fly shop. Most of the activities on the island are centered around the sea and include both flats and reef fishing snorkeling and scuba diving. 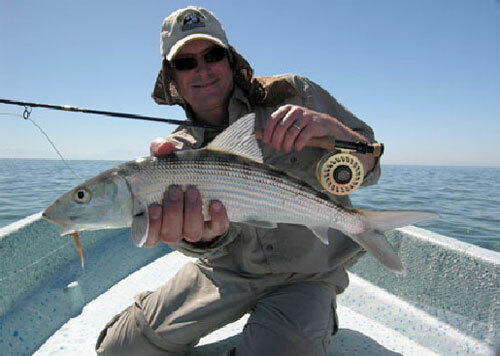 Our name, El Pescador, means “The fisherman” and we specialize in fly fishing and light tackle flats fishing. 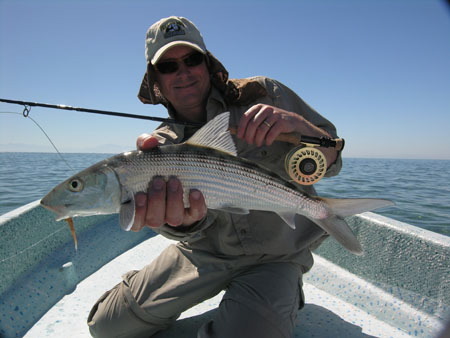 The guides are all English speaking and experienced in guiding both fly and spin fishermen. 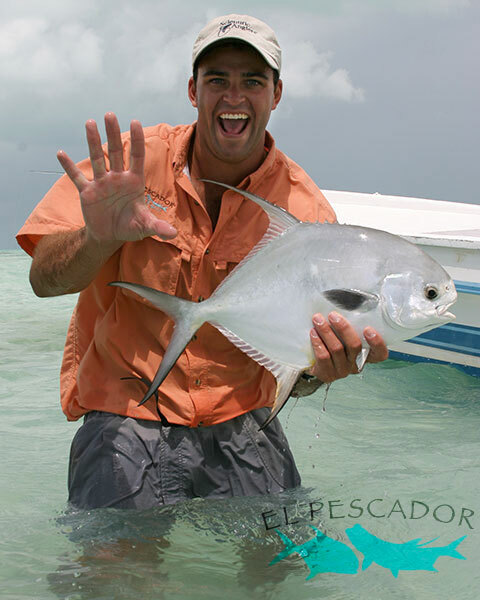 Most of the guides have been working with El Pescador for over 15 years. WE are now working and training a third generation soon we may have 3 generations working at the same time!! 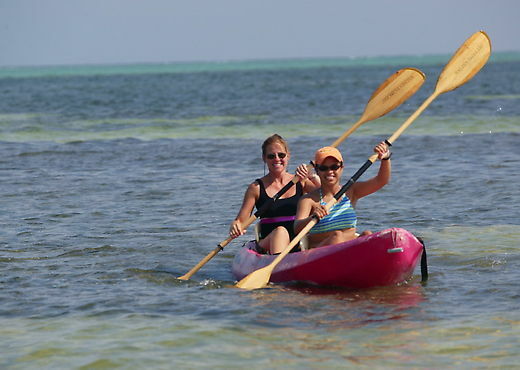 They use a shallow running panga style boat with poling platforms, these boats are the optimal tool for comfort in ride and shallow water performance. 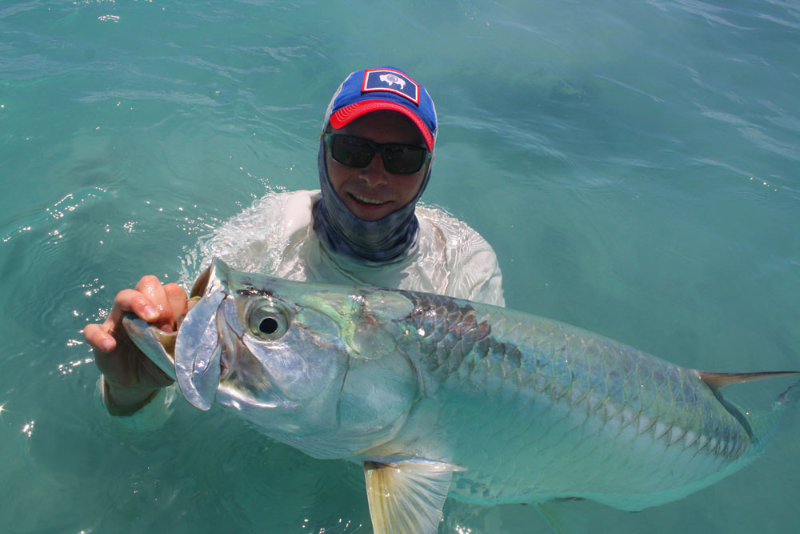 The guides have the best fly fishing skills of any destination in the Caribbean. 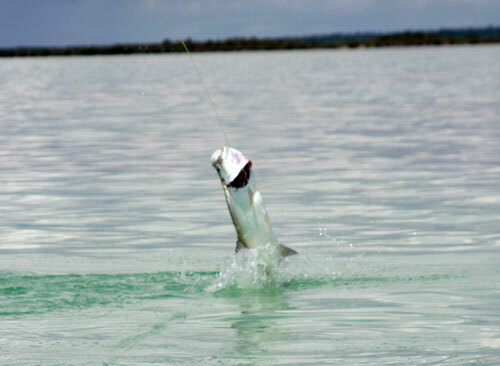 The bonefish flats are 10 to 50 minutes from the lodge and the tarpon flats start 30 minutes from there. 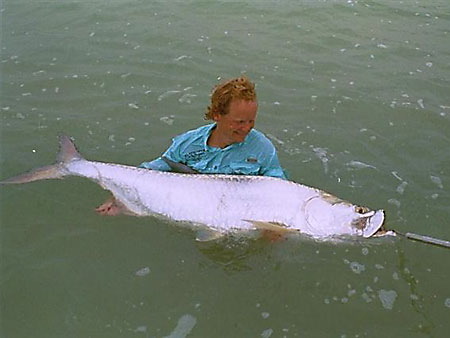 Most of the bonefishing is done from the bow of a boat but there are many flats that can be waded. The bones run from 1-7 pounds and are plentiful. Most fish are in the 2-3 pound range. They can be found in huge schools or singles and doubles depending on the area you fish. Some folks enjoy the numbers that can be had by fishing the large schools while other anglers love the hunt and are happy to catch less fish for the fun of stalking a large tailer. 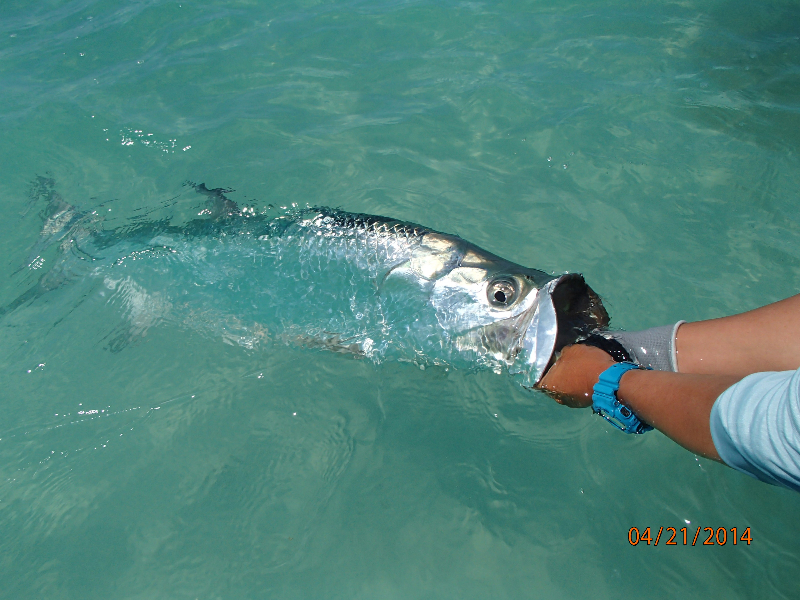 The tarpon are found year round in channels 20- 30 feet deep or on the flats 2-8 feet deep. 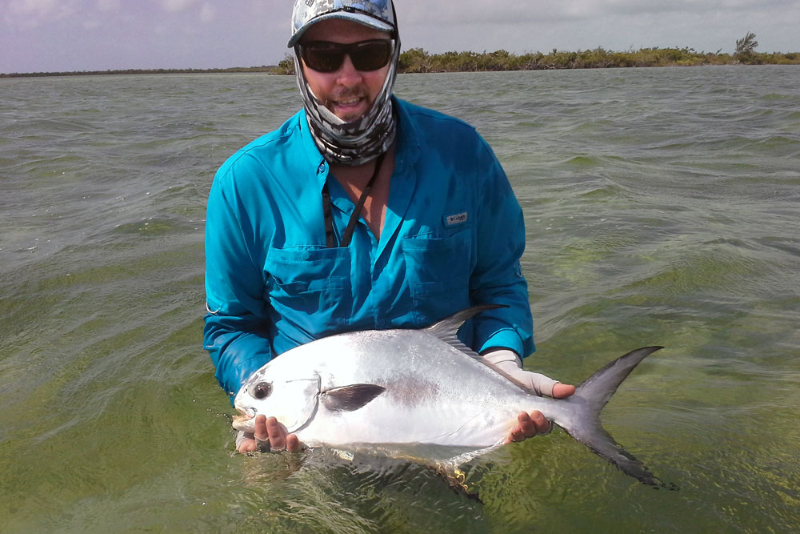 The flats and channels are 45-80 minutes from the lodge. 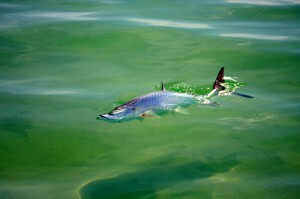 The flats and are quite extensive and offer the only true flats fishing for tarpon outside Florida. 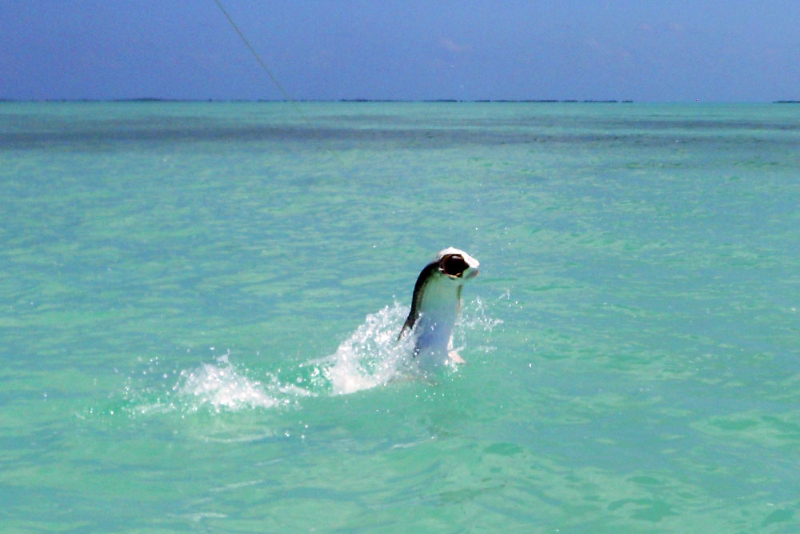 Needless to say one hunts for tarpon. 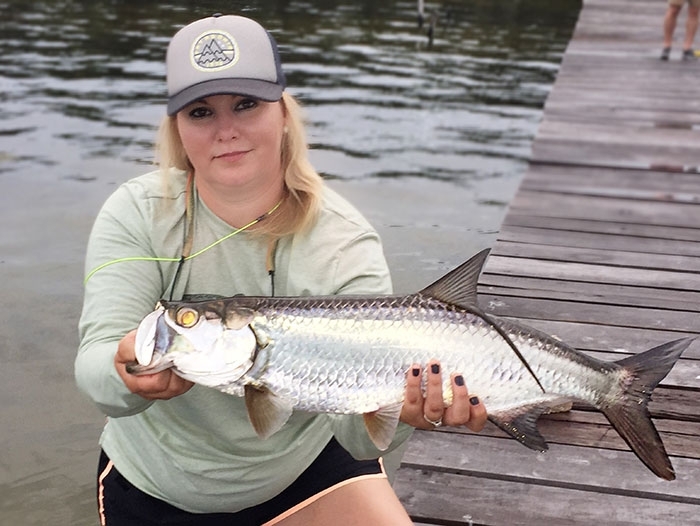 Not all the tarpon flats are fishable everyday due to changing weather conditions and currents, generally speaking we have good tarpon fishing year round. 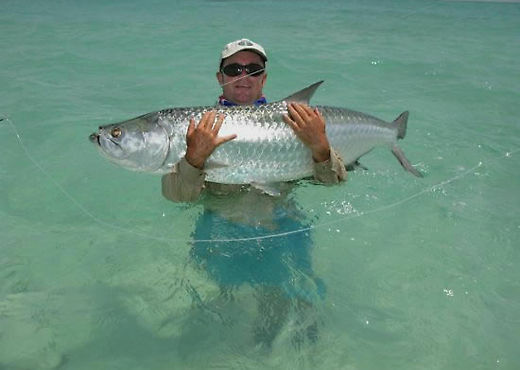 The tarpon run from 10 to well over 100 pounds; the average winter fish is about 15-50 pounds with the average summer fish being 90 – 150 pounds. 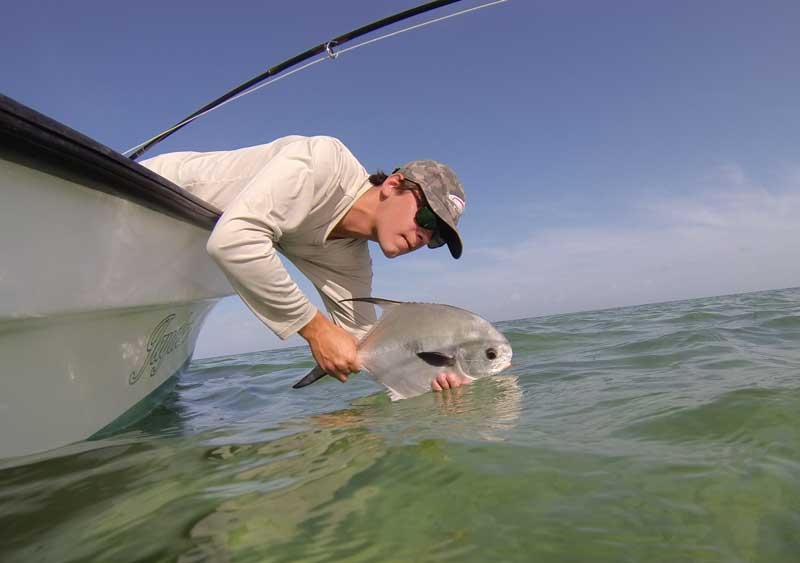 Permit are found on the deeper bonefish flats, some of the shallow tarpon flats as well as in waves coming over the reef. 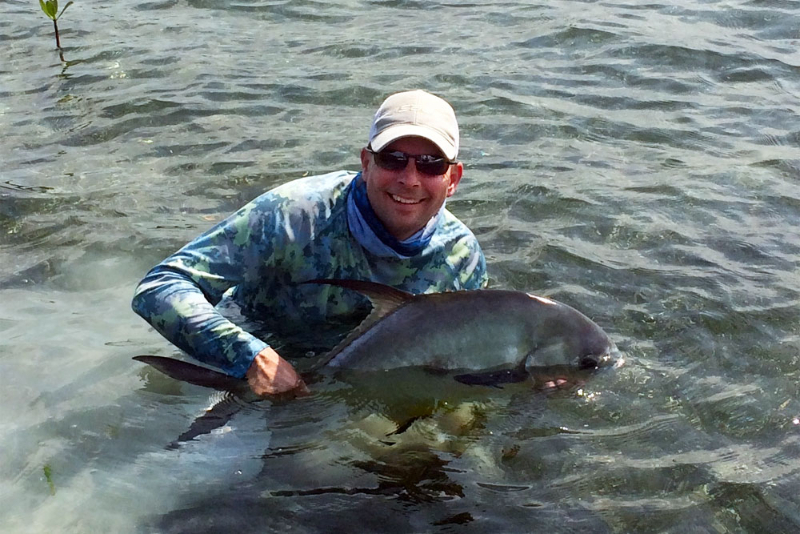 Our permit range from 4-30 pounds with the majority being about 8-10 pounds and found in large schools. 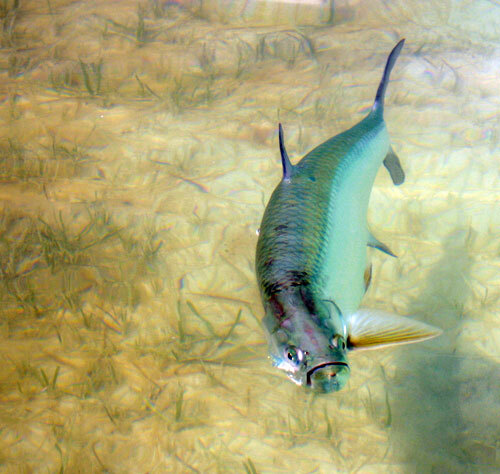 Jack Crevalle, Barracuda, Cobia and Snook are also found on the flats and in the surrounding mangrove lagoons. The fifth permit of the day for this lucky fellow! 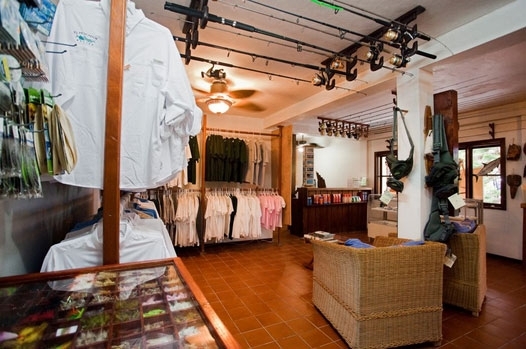 El Pescador has a fully equipped fly shop with all the local patterns, lines, leaders and tools you may need. Rod rental is available as well. 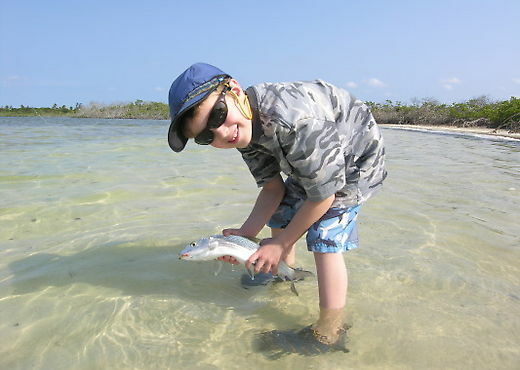 We also offer daily casting clinics to sharpen your skills after your day of guiding. 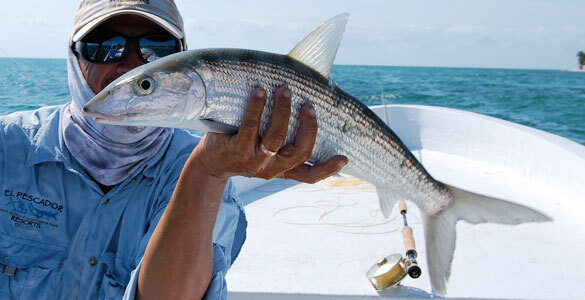 The year round availability of bonefish, tarpon and permit is pretty unheard of. 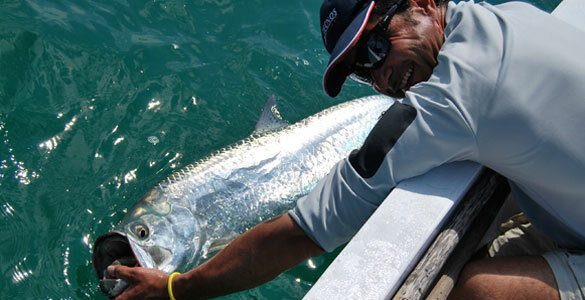 El Pescador has one of the most even mix of fish in the world making a grand slam possible year round. The only thing stopping you is that you are reading this instead of being in Belize with us! The normal fishing day is 7 am to 3 pm. 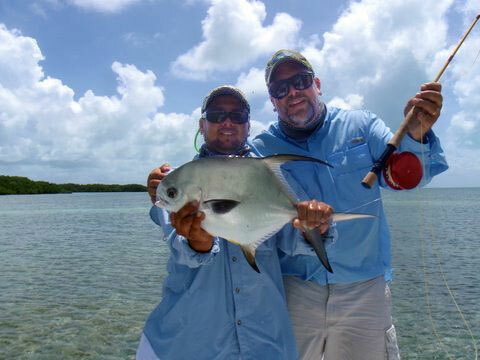 Your guide may arrange an earlier or later start based on weather, what you want to fish for and the tides. If 8 hours on the water is not enough for you El Pescadors beach and the beaches within a short walk north, harbor bonefish and permit. These grassy flats make tailing a daily occurrence. 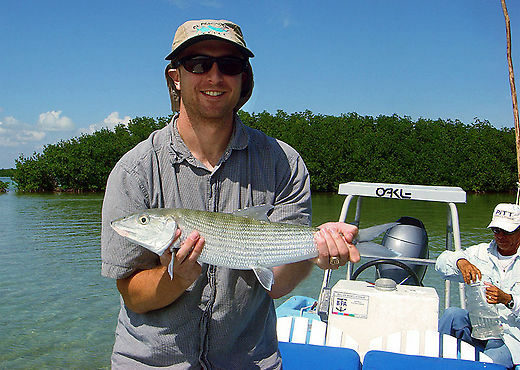 There is also a lagoon system in the back that has some wadeable flats for bonefish Use one of the resorts kayaks to reach these spots. 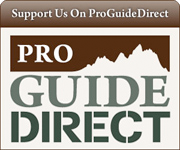 If you would like a longer day with the guide it may be possible at an extra cost of $50 per hour. This is solely up to the guide and should not be considered a tip for the day, simply overtime pay. Please keep in mind that 8 hours of operating a boat, poling and searching the water for fish is a hard work, maybe there is an after school play their daughter is in…. 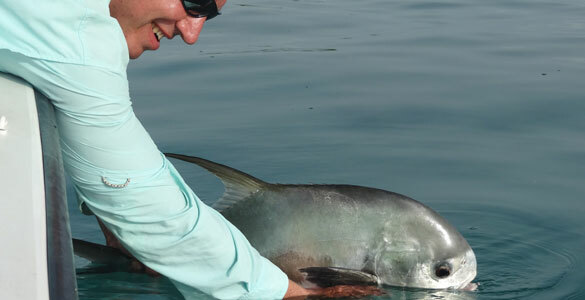 If you have some special needs our fishing manager will work it our for you and your guide. 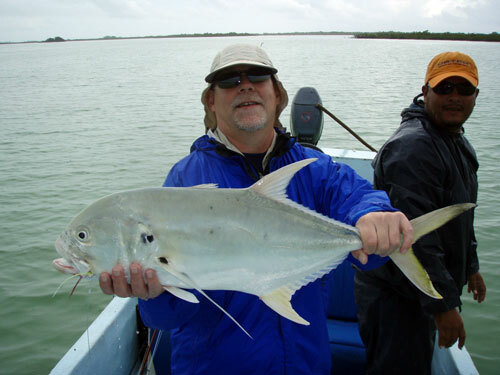 Reef fishing is another activity our clients enjoy. The reef sports snappers, grouper, wahoo, mackerel, jacks, cobia, barracuda, king fish, rainbow runners, trigger fish and during mid May to mid August, tarpon. A great day on the reef might include catching snappers, grouper, etc., going to shore and having the guide prepare a freshly caught shore lunch while you relax or wade for bonefish. 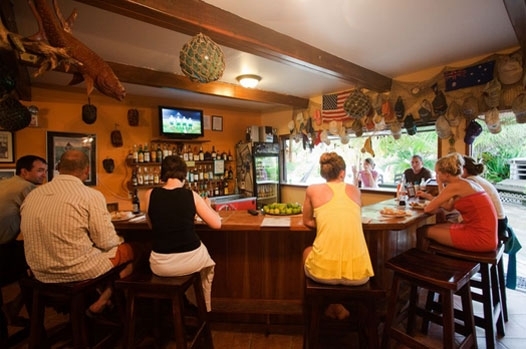 After lunch you can go for a snorkel and/or trip into San Pedro town for a little sight seeing, bar hopping, whatever. 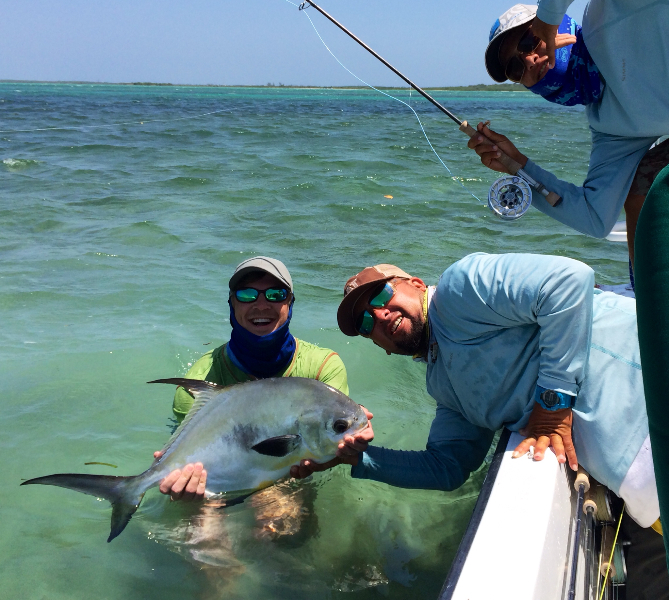 Special 2 for 1 pricing for all trips taken between July 1, and Dec 15 – 2 anglers can go for the price of a single angler (please see the one per boat, 1 per room price) and if you don’t have 2 people and you are traveling alone, singles get 30% off the one per boat one per room price! The fishing is better than ever during the summer and fall, it is just that most folks from the northern half of the US think of going to the Caribbean that time of year. Take advantage of these prices! Please use the drop down lists below to find the package that suits your needs the most. Any package can be customized to fit your needs, need a 7 night package with three days of fishing – no problem we can do it! Just drop me an email and I will work out the price for you. 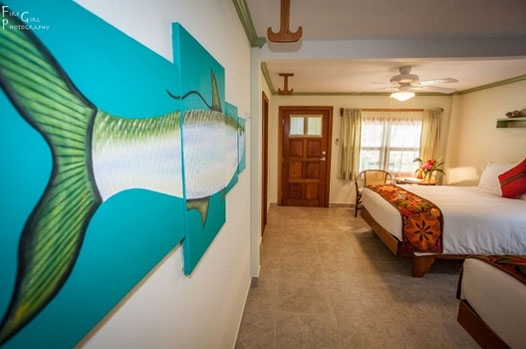 Prices Include: round trip air transportation from Belize City to the lodge, Boat transfer from the airstrip to the lodge, three meals a day, guided fishing each day ( for fishing packages), unlimited use of all amenities of the resort, including canoes, kayaks, gym, wifi, and bicycles. 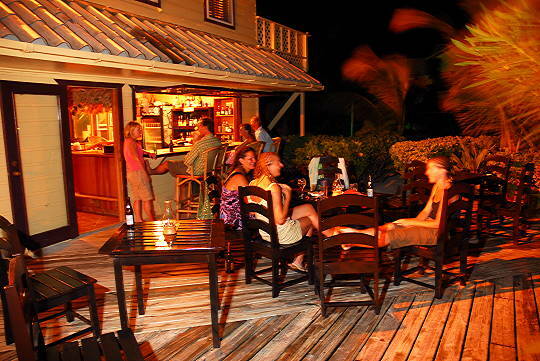 It includes an open bar for all Belizean beer, Belizean soft drinks and Belizean alcohol ( rum). It also includes all taxes. Prices quoted are in US dollars. 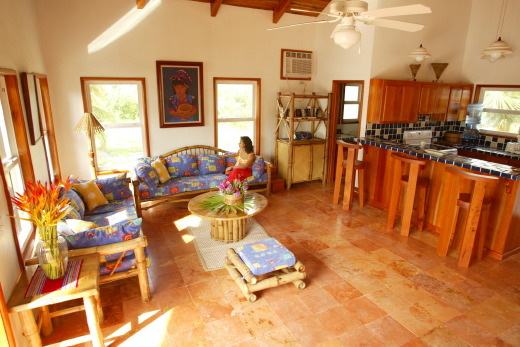 Single Occupancy upgrades to a Villa accommodation add $100 per night. 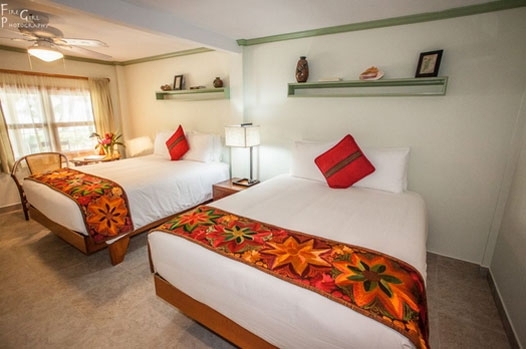 Special 2 for 1 pricing for all trips taken between July 1, and Dec 15, 2013 – 2 guests can go for the price of a single guest (please see 1 per room price) and if you don’t have 2 people and you are traveling alone, singles get 30% off the one per room price! The fishing, sightseeing, diving is better than ever during the summer and fall, it is just that most folks from the northern half of the US think of going to the Caribbean that time of year. Take advantage of these prices! 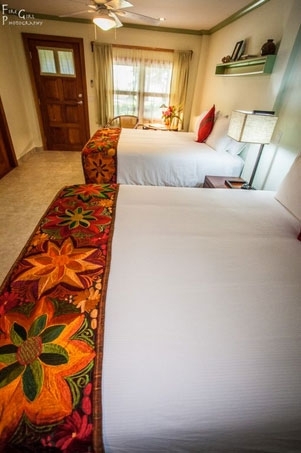 Special 2 for 1 pricing for all trips taken between July 1, and Dec 15- 2 guests can go for the price of a single guest (please see 1 per room price) and if you don’t have 2 people and you are traveling alone, singles get 30% off the one per room price! The fishing, sightseeing, diving is better than ever during the summer and fall, it is just that most folks from the northern half of the US think of going to the Caribbean that time of year. Take advantage of these prices! 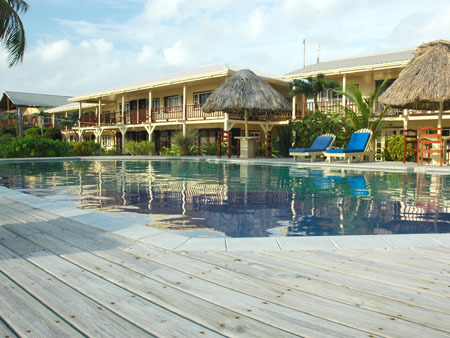 The number of nights lodging and days diving* specified in your package, roundtrip air, land and sea transfers between Belize City and El Pescador, 3 meals per day, hors d’oeuvres, local Belizean beverages consumed at our bar (including soda, beer and rum), complimentary use of all amenities (pools, internet, gym, kayaks, bikes, etc), hotel tax, GST tax and a welcome drink. *Diving is based on 2-tank local dives daily for certified divers. Rates include weights, weight belt and tanks. Personal dive gear may be rented. 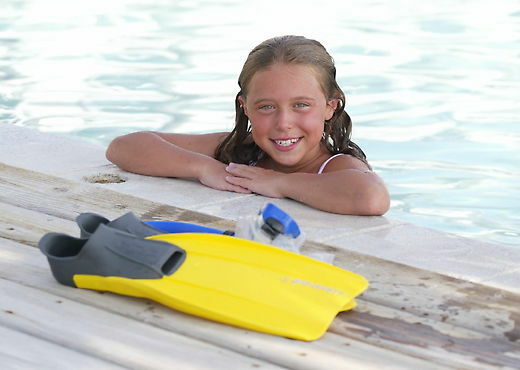 If you are not certified we also offer PADI courses and will customize a package for you. Prices do not include: gratuities for divemaster or hotel staff, imported alcoholic beverages, or items purchased in our gift or tackle shop. Park fees (if applicable), diving gear (which may be rented). 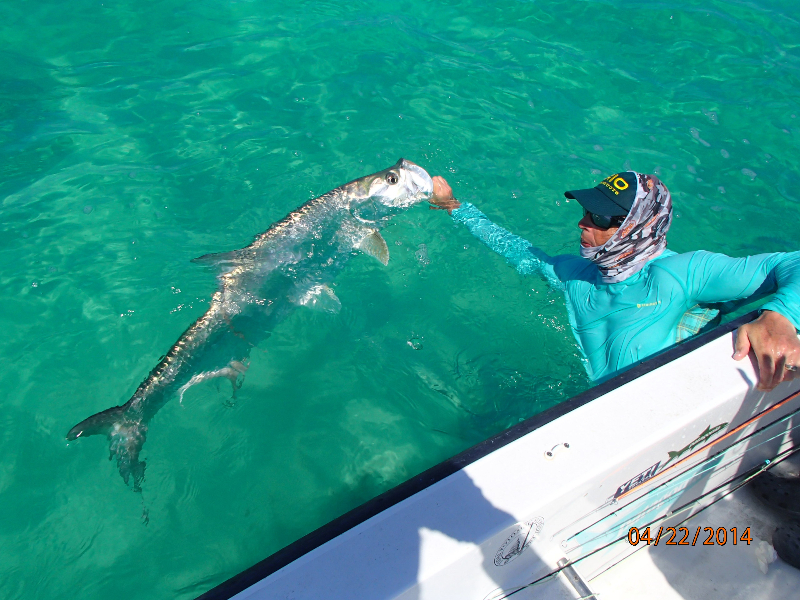 Please take a look at the photo and video galleries as well as browse the PDF articles and publications related to El Pescador. 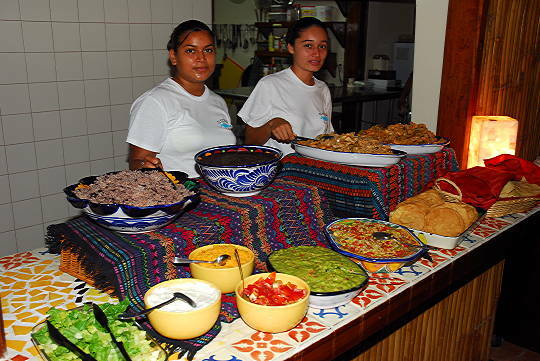 El Pescador’s access to lots of activities is what makes it so appealing to couples and groups that have mixed interests. Some love to fish some don’t. Some love to dive, some don’t. 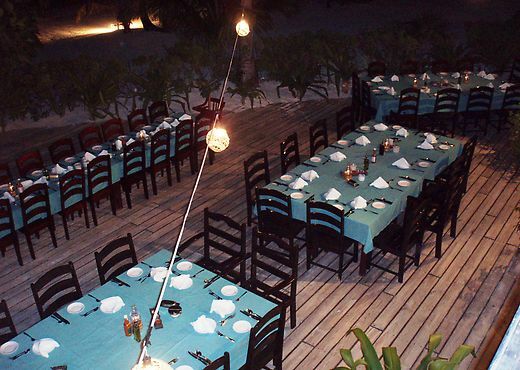 Mayan ruins, Jungles ocean activities are all easily accessible form El Pescador. 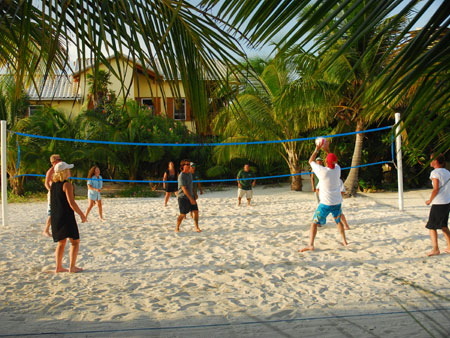 The activities below are tours that are available for an extra charge. 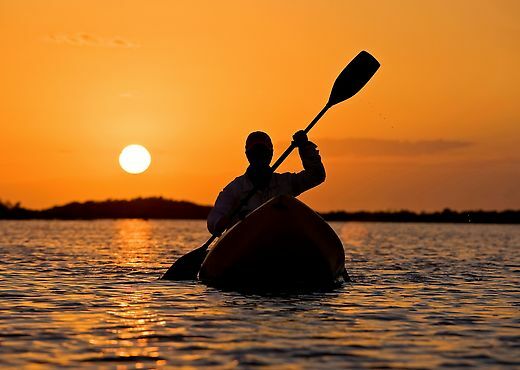 Don’t forget we have kayaks, canoes, bicycles, fly fishing lessons al free of charge included with any stay. Please use the collapsible menus below to explore some of the different options. 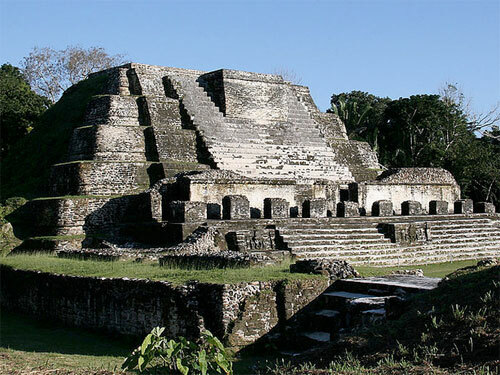 Covering roughly 25 square miles, Altun Ha is about an hour outside of Belize City in the Belize District. The site consists of three ancient Mayan plazas and thirteen structures. 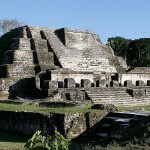 Archeologists estimate the Maya first settled the site around 250 BC and began construction in 100 AD. At its peak, the site was an important trading center with over 10,000 Maya living in the vicinity. The most significant specimen excavated here was a ten pound jade carving of the Maya Sun God, Kinich Ahau. The largest jade figure found in Maya ruins, the head was discovered by Dr. David Pendergast and is exhibited at the national museum in Belize City. This is the same head featured on Belizean currency. Visitors can climb to the top of three of the ancient temples and take in the spectacular views. Meander up the New River to see spectacular plants and animal life. Tour Altun Ha and enjoy lunch at Maruba Jungle Spa which offers beauty services, horseback riding or a luxurious dip in the pool. 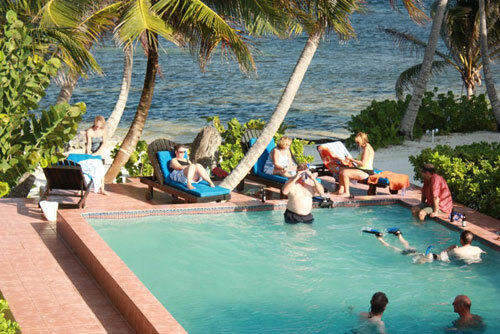 Bacalar Chico Island Tour: Explore the entire northern region of Ambergris Caye during a complete “Loop” of the island. 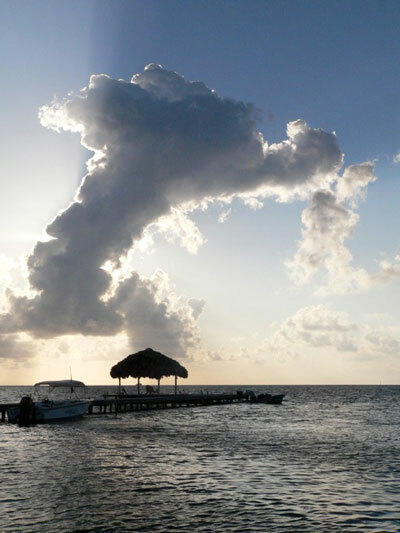 Enjoy three different pristine snorkel stops, Pass through the Mayan channel that separates Belize from Mexico. 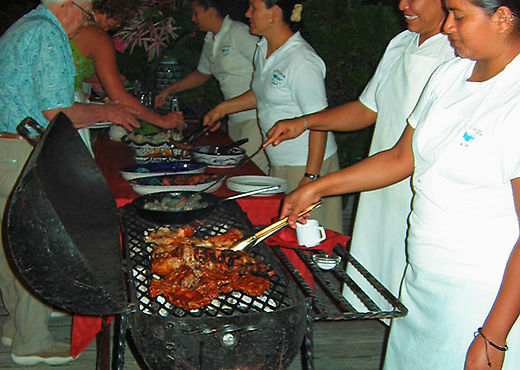 A nature walk over the Mayan mounds could discover old pottery from ages past, followed by a barbecue lunch. Belize Zip Line and Aerial Canopy Tour: This zip line tour starts in the limestone foothills of Belize. You’ll hike into the rainforest and begin your tour 80 feet above the forest floor. Secured by a body harness and protected with a helmet and gloves, you’ll be attached to a steel cable and travel the zip line between eight separate tree platforms. It’s an exhilarating experience with spectacular views and a perspective you won’t get anywhere else. Cave Tubing and Zip LineZip Line Adventures: Travel by boat to the mainland where you will enjoy a refreshing tubing adventure down a river and through ancient mayan caves. Then soar atop the jungle canopy in Belize. Belize Zoo Day Trips: The Belize Zoo is a very popular destination for guests who want to see the largest congregation of wildlife in Belize. Over 125 animals and 84 acres. Originally founded in 1983 as a retirement center for animals left after the filming of a nature documentary, the Belize Zoo and Tropical Education Center is now home to over 125 animal species native to Belize. Occupying over 84 acres, the zoo has acquired animals who were orphaned, rehabilitated or donated. Rather than using cages or cement bunkers, the animals at the Belize Zoo live in large mesh & wood enclosures with plenty of native plants. Some of the animals you’ll find at the zoo include: tapirs, spider monkeys, toucans, peccary, ocelot, puma, jaguars, falcon, kinkajou, agouti, howler monkey (baboon), tayra, paca, margay, snakes, stork, crocodiles, jaguarundi, gray foxes, curassow, parrots, barn owls, coatimundi, raccoon, hawks, collared aracari, eagle, crested guan, and the scarlet macaw. Float on an inner tube as the river winds its way through the rainforest and into caves containing spectacular crystal formations, the very entrances to the ancient Maya underworld. 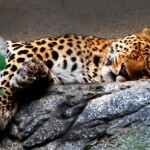 Then, travel to the world famous Belize Zoo to see our wilder residents, up close and in their natural settings. 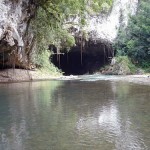 Belize Cave Tubing: Cave tubing in Belize is an adventure you’ll never forget. Ancient Mayans believed the caves were the entrance to the underworld and considered them sacred places. Take in the ancient beauty of these caves while floating on an inner tube as the river winds its way through the rainforest and into caves containing spectacular crystal formations. Float on an inner tube as the river winds its way through the rainforest and into caves, the very entrances to the ancient Maya underworld. 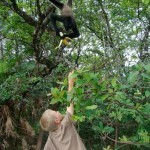 Then, travel to the world famous Belize Zoo to see our wilder residents, up close and in their natural settings. Meet a local celebrity, April the Tapir, our national animal, as well as howler and spider monkeys, scarlet macaws, a variety of crested birds, deer and wild peccaries, and 5 species of cats including the elusive jaguar. Travel by boat to the mainland where you will enjoy a refreshing tubing adventure down a river and through ancient Mayan caves. Then soar atop the jungle canopy. Crooked Tree Bird Sanctuary Tour: A paradise for birders, Crooked Tree Bird Sanctuary is managed by the Belize Audobon Society. Local residents provide guide and boat services. You’ll see more birds by boat, but there are walking trails throughout the sanctuary as well. A wetland habitat that fluctuates with the seasons, the connected lagoons, savannas and creeks within the Crooked Tree Bird Sanctuary are an ideal habitat for native and migrating water birds. Over 275 species of birds have been identified here. Depending on when you visit, you may see egrets, herons, numerous species of ducks, and double crested cormorants. November marks the beginning of the mating and nesting season for the jabiru stork, the largest birds found in North and South America. Their stick nests are completed by January and leave, probably for Campeche, Mexico, with their young by June. Another distinguished Crooked Tree citizen is the peregrine falcon. Many avid birders come to the sanctuary to watch these lightning fast falcons hunt water coots. Many kingfishers and ducks also inhabit the sanctuary, along with snail kites. Hidden along the river banks are turtles, crocodiles, Central American otters and iguanas. 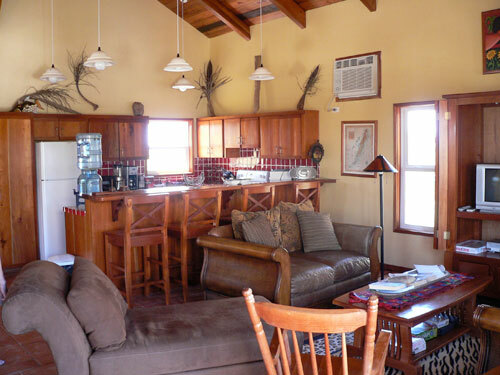 Bird and wildlife enthusiasts won’t want to miss this fascinating place! Crooked Tree Bird Sanctuary and Altun Ha: Take a cruise on the Crooked Tree lagoon to view numerous species of birds and then travel to the Mayan site of Altun Ha. Custom Activity packages available. An ideal location for snorkeling and diving, the Hol Chan Marine Reserve is just 4 miles south of San Pedro, Ambergris Caye. 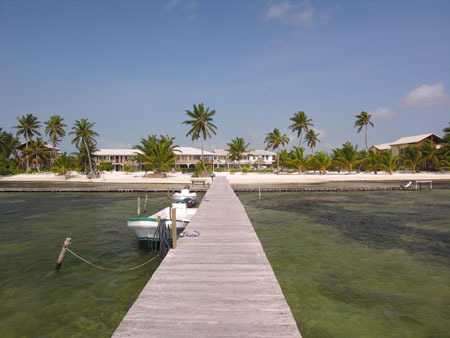 Established in 1987, Hol Chan covers an area of approximately three square miles and was the first marine park established in Belize. 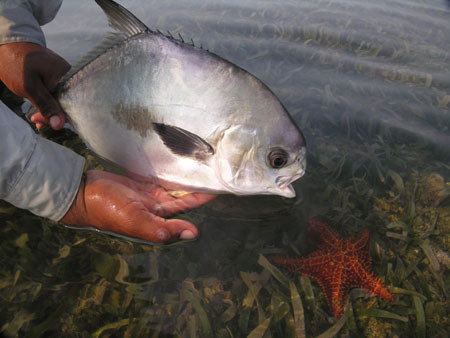 Originally threatened by over fishing, the rich and diverse marine life of Hol Chan has experienced an encouraging regeneration under the sanctuarys protection. In Mayan, Hol Chan means little channel. Named for a break in the Belize Barrier Reef approximately 25 yards wide and 30 feet deep, the channel was probably the result of erosion and exposure. The currents created by the channel contribute to a unique ecosystem and spectacular array of marine life. This habitat contains a stunning variety of corals including elkhorn, brain, Starlet, boulder, staghorn, finger, lettuce, fire and pillar. Many lobster are found here as well as schools of snappers, grunts and blue tangs. Commonly seen reef fish are hog fish, parrot fish, barracuda, triggerfish, black tip reef sharks and nurse sharks. The channel itself is the most popular area of the reserve and here you’ll find large grouper, spadefish and the occasional permit, tarpon, manatee and eels. This zone provides the link between the mangrove and reef zones. Queen conch, manatee and bottlenose dolphin are found here. In addition to many unusual species of sponges, the sea grass or lagoon zone also contains the Boca Ciega blue hole. This underwater cavern is popular with divers because of the large schools of fish that gather there. 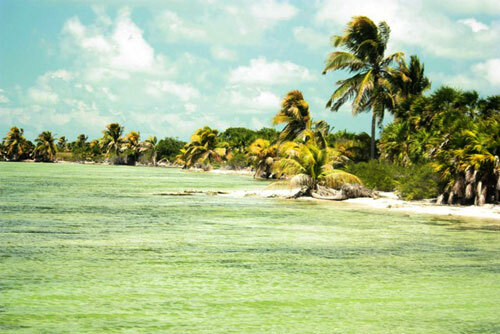 Within this zone are seven mangrove cayes and numerous channels including Boca Chica. The mangrove root system provides a rich habitat for sponges, anemone, young fish, invertebrates and tunicates. This zone was annexed by the reserve in 1999. 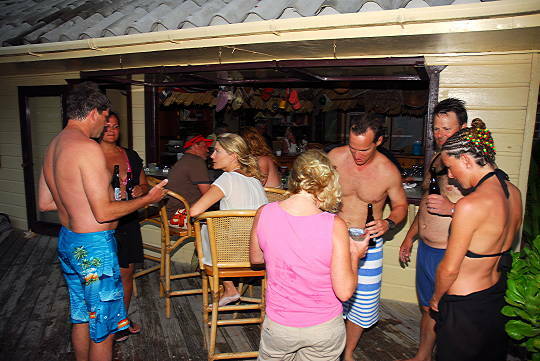 Local dive guides began frequenting the area after having been told of the proliferation of sting rays and nurse sharks. Fisherman had been cleaning their daily catch here for many years and the rays and sharks boldly approach boats and humans, hoping for a tasty handout. Both species are known to be quite gentle. While the animals may swim up and seem to invite physical contact, it’s best to enjoy the view and keep your hands to yourself. 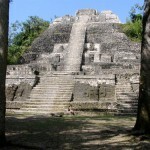 Lamanai Mayan Ruins Tour: One of the largest and oldest Mayan sites in Central America, the Lamanai Mayan Center consists of more than 800 structures. Archeologists believe this center of Mayan civilization was settled as early as 1500 B.C. Named for the crocodiles who continue to live in and along the New River, (lamanai means submerged crocodile in Mayan), the site is reached by taking a boat upriver through the jungle. Excavation of the site began in 1974 and it is believed that hundreds of ruins remain buried in the nearby jungle. A number of significant structures have been excavated and can be explored by visitors including the Ball Court, Jaguar Temple and Lag Temple where a 125 foot climb to the top is rewarded with an incredible panoramic view of the ruins and New River Lagoon. An exceptional clear and unpolluted river leads you to the New River Lagoon and the ancient Mayan City of Lamanai (Submerged Crocodile). Tour temples and carved stone monuments nestled in the tropical jungle. The excavations done at Lamanai show a variety of structures including temples, residences and palace buildings. Birdwatchers, this is the one for you! Belize Manatee Watching Tour: Visit a secluded mangrove island outside of Belize City, a natural habitat for the West Indian Manatee. View the shy manatee as it comes up for air or just long enough for you to snap its photo. The manatee, also known as a sea cow, is a large, gentle mammal that can be found in the warm waters of the Atlantic Ocean from the southeastern U.S. to Brazil. Manatees prefer shallow waters but thrive in fresh as well as salt water. Manatees are gray or brown in color, quite wrinkled and are covered in bristly hairs. They typically live for 50-60 years. Adults grow to 9-10 feet in length and weigh in at about 1000 pounds. They are herbivores and spend much of their waking hours grazing on 50-90 pounds of sea grasses per day. Manatees are known for their gentle nature. With no natural predators, the manatees biggest threat is man. While the manatees of Belize are no longer hunted for food, they are threatened by boat traffic and fishing nets. Watching these shy and fascinating creatures is one of the most popular activities for our guests. 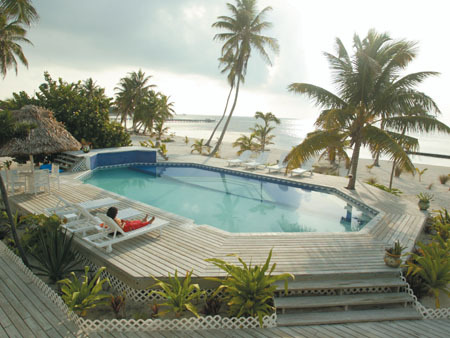 We’ll take care of everything once your international flight arrives in Belize. 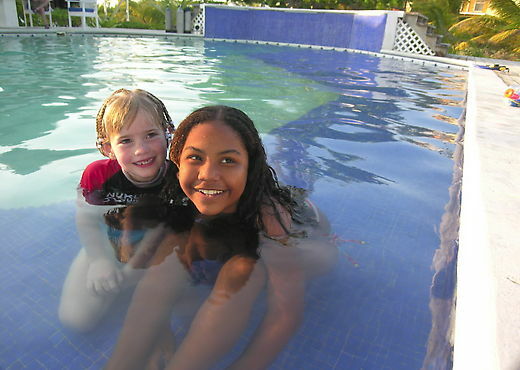 We’ll make sure your experience once you get to Belize is hassle free. Leave it to us. You’re on vacation! 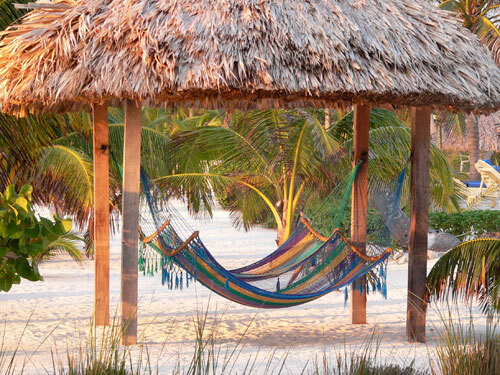 To enter the country of Belize, US citizens are required to have a valid passport that does not expire within 90 days of arrival and a return airline ticket. US citizens are allowed to stay for 30 consecutive days. After clearing Customs please continue into the Main Terminal and to the Tropic Air counter. You will find your tickets waiting for you under both “El Pescador” and your last name. Your adventure begins with a quick, scenic 20-minute flight to San Pedro, Ambergris Caye where a representative from El Pescador will meet you at the San Pedro Airstrip. Our representative will greet you at the San Pedro airstrip and transport you and your luggage to our boat for the seven minute ride to El Pescador. NOTE: If you miss your connection, you will automatically be placed on the next available shuttle. If your International flight has been very delayed and you are not scheduled to arrive until after 5:00pm, please call El Pescador at 226-2398 (Internationally 011-501-226-2398) and we will reschedule your flight. US visitors staying for 30 days or less need a return ticket and a passport. 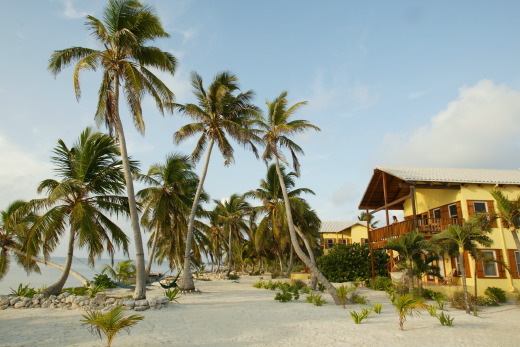 All US and Canadian citizens are required to have a valid passport for entry in and out of the Belize. Some visitors that are not citizens of the U.S.A. may also require a visa, check with your country’s consulate.